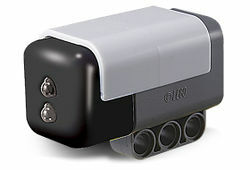 MS1038 Colour Sensor is a Mindstorms set released in 2007. It contains a colour sensor for the Mindstorms NXT. This is a description taken from LEGO.com. Please do not modify it. See a rainbow of color! Using the NXT Brick (sold separately), the Colour Sensor enables your robot to distinguish not only between black and white, but also a range of bright and pastel colours. Does not include connector cable. Facts about "MS1038 Colour Sensor"
ShopDescription See a rainbow of color! This page was last edited on 9 January 2016, at 20:57.